The largest event of its kind in the Carolinas, the Mad Monster Party horror convention will return to Charlotte, North Carolina in February 2018, and the lineup of genre icons already announced looks epic, including Nick Castle, who played Michael Myers/TheShape in John Carpenter’s Halloween (and will reprise the role in the new Halloween); Ken Kerzinger who played Jason Voorhees in Freddy vs. Jason; and Robert Englund, the legend who is Freddy Krueger in the Nightmare on Elm Street films. Michael Biehn (The Terminator, Tombstone, The Abyss) is also among the headliners, along with genre favorite Lance Henrikson (Pumpkinhead, Near Dark), both of which are part of an Aliens reunion that also includes Jennette Goldstein (Near Dark). Former Elm Street residents Amanda Wyss and Tuesday Knight round out the guest list that has been revealed so far. Katharine Isabelle (American Mary, Ginger Snaps, Hannibal) joins Englund and Kerzinger for a Freddy vs. Jason reunion, while UPDATE: Katharine Isabelle has had to cancel her appearance due to to work commitments. UPDATE 1: Peter Criss, drummer and co-founder of the classic rock band Kiss, is also coming to Charlotte. UPDATE 2: Alex Vincent, the star of the original Child’s Play as well as last year’s Cult of Chucky, is coming to the Party, along with Child’s Play 2 actress Christine Elise (Beverly Hills 90210, E.R.). UPDATE 3: The great Sid Haig has had to cancel due to professional commitments. (The Devil’s Rejects, THX 1138) will once again join the Party for all three days, and on Sunday morning (Feb. 18) will be participating in a rare photo op in full costume and makeup as his iconic character Captain Spaulding from Rob Zombie’s House of 1,000 Corpses. UPDATE 4: The awesome twin sister team of directors Jen and Sylvia Soska (American Mary, See No Evil 2, Hellevator) are joining the Party this February. UPDATE 5: The Nightmare continues, as Ronee Blakely of A Nightmare on Elm Street and Lisa Wilcox and Danny Hassel of Elm Street parts 4 and 5 have been added to the lineup. UPDATE 6: Pro wrestlers Kane (Saturday only) and Mick Foley are coming to Charlotte. UPDATE 7: A special Letherface photo op will take place Texas ChainsawMassacre Part III star R.A. Mihailoff in his original screen-used outfit, along with the sequel’s director Jeff Burr and the iconic screen-used “Excalibur” chainsaw! Mihailoff and Burr will be there all three days, but the Leatherface photo op is on Saturday, Feb. 18 only. UPDATE 8: WWE Hall of Fame member Animal of the legendary Road Warriors tag team will be at the NWA Legends table in Charlotte. UPDATE 9: Tom Savini (Dawn of the Dead, From Dusk Till Dawn), Felissa Rose (Sleepaway Camp, Victor Crowley, Tales of Halloween), and Eugene Clark (Land of the Dead) are all coming to Party. More guests are expected to be announced in the coming weeks, and this post will continue to be updated as the news is released. Halloween Daily News is proud to once again be a part of Mad Monster Party, as we will be providing extensive coverage of the entire event, including photo galleries of all the vendors and amazing cosplay, highlight videos, and interviews. We will also have a table at the convention, and we look forward to seeing everyone there! 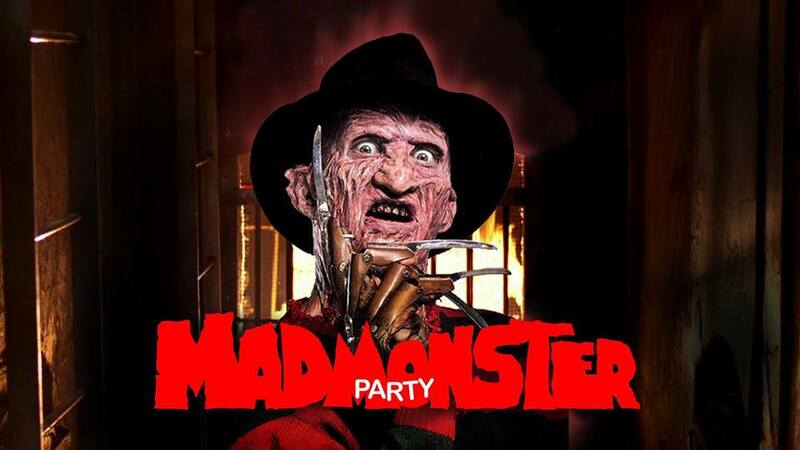 Mad Monster Party 2018 is happening the weekend of February 16-18 at the Hilton Charlotte University Place in Charlotte, North Carolina. Tickets are available here.